Though trampolines are made for excitement and fun, cleaning them should be an inevitable part of everyone's routine. If your trampolines are in your backyard, it is obvious that it will face the wrath of the weather, withstand dirt and bugs and much more. And, if you do not feel like cleaning it on a regular basis, your trampoline will become unusable soon. Even if you have installed the all-weather trampoline covers, it is your duty to remove the cover sometimes and clean it thoroughly. A general rule of thumb is, you should not clean your trampoline when the weather is cloudy, or it is raining outside. If you do so, it will become very difficult for you to dry the trampoline later. Therefore, you should clean it when the weather is sunny so that your trampoline can dry fast and you can assemble it back again for your kids to enjoy it. The first step is to use the brush for sweeping the mat and getting rid of the debris and dirt. Ask help from someone so that you can sweep all the unwanted dirt from your springs as well. Next, you have to use the hose and soak your mat in water. Scrub the Trampoline mat with warm water which is soapy and make use of the soft brush. Scrubbing hard can damage the entire material. So ensure that you are doing it slowly but swiftly. You can walk in small sections or scrub the entire mat before you start rinsing it. Use the water hose for rinsing off the soap from your trampoline mat. Use the towels for drying the mat and then keep it uncovered so that the air and sun can dry it. After rinsing and cleaning the trampoline mat, you have to start cleaning the protective pads and the springs as well. These steps will help you to clean the trampoline thoroughly and get rid of all the dust and dirt particles easily. Cleaning a trampoline regularly also ensures that the germs that your kids bring are washed off. Try to clean your trampoline mat and enclosure net on a regular basis only if the weather is sunny. Since you will be using a lot of water to clean your trampoline, you can use the rust protection sprays on the ladder and the springs to protect them from rusting. If you observe tiny white spots or rust developing on your trampoline spring or ladder, you can make solutions of one part of vinegar and three parts of water. By using a toothbrush, you can use this solution to scrub the affected area. Keep it on for a few minutes, and then you can rinse it off. Avoid using harmful chemicals for cleaning your trampoline as they can easily damage the components. A few chemicals are capable of interfering with the ultraviolet resistance of your trampoline jumping pad. Water and mild soap are the best combo for keeping your trampoline neat and clean. You can purchase a spray if you want which will help keep your trampoline clean throughout the year. 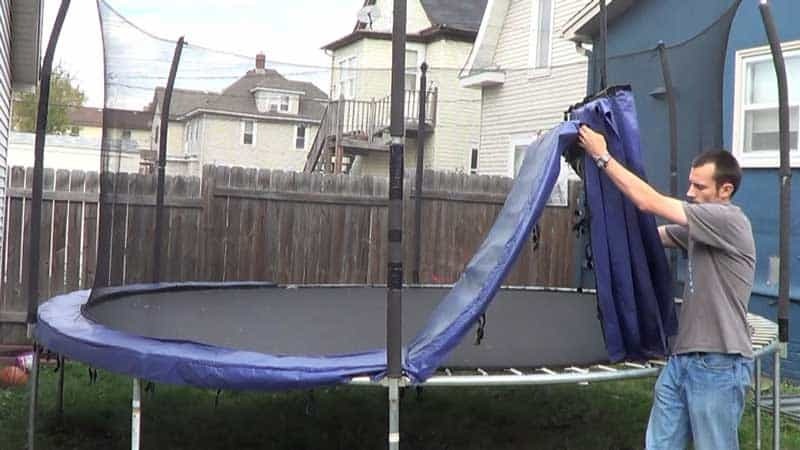 You can cover your trampoline with a strong weather cover when it is not being used for a long time. For example, if you are going for a vacation, cover your trampoline so that you can prevent dust from landing on your trampoline or the weather from damaging the apparatus. Mats that have additional ultraviolet protection can also become dry when they are exposed to the sun for a long time. In case the fabric becomes dry, holes may be formed which can be extremely hazardous for the jumpers. Keep a shovel and brush handy so that you can clean the leaves that fall on your trampoline regularly. When you clean, you should check if there is any damage or rust on your trampoline frame. Apply the anti-rust lubricant or grease to prevent the rust from spreading. If you want to clean your trampoline effectively and more effortlessly, it is much better to move to the in-ground ones. In case of these trampolines, no nets are required. You can brush the trampoline easily and quickly.